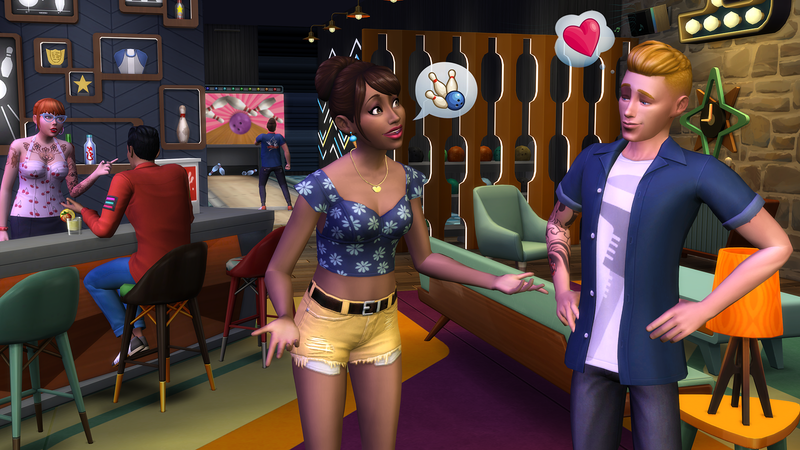 The Sims 4: Bowling Night Stuff Pack is Coming Soon! Today was an exciting day in the sims community for most simmers because Electronic Arts/Maxis released the trailer for The Sims 4: Bowling Night Stuff as well as a blog post with all sorts of goodies we can look forward to in this pack. Also, we can expect a Livestream from The Sims Team regarding The Sims 4: Bowling Night Stuff this Friday at 3:30 CST/1:30 PDT/4:30 EST so mark your calendars! But Don’t worry if you can not attend because the Livestream will be available to rewatch after it is over on Twitch. I’m really excited for the bowling skill because it is really fascinating how well done the animations and Rewards/Competition System were done! As you level up your bowling skill you can unlock new colour bowling bowls which I think is really cool and adds a feeling of accomplishment to the game while still being a fun activity to do with your family or even maybe your whimsical other on a date. Though I am not here today to go too in-depth on this pack as we will have more articles regarding The Sims 4: Bowling Night Stuff Pack in the coming days though we do have a blog post below for you to see from Maxis! Lace up your bowling shoes and set those pins, The Sims™ 4 Bowling Night Stuff* is coming March 29th, 2017! Is your Sim ready to take on a fun new hobby? Well, bowling might be just the thing! 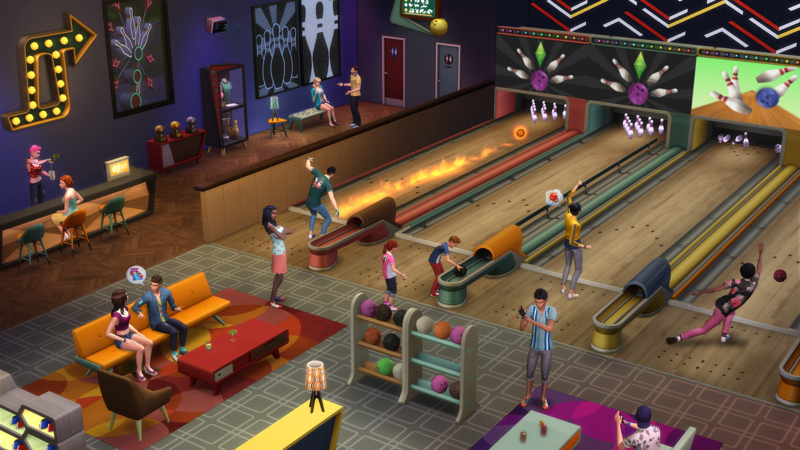 In The Sims™ 4 Bowling Night Stuff your Sims can enjoy a casual night out with friends, hit the lanes with a hot date, or share a night of family fun together. And while the Mansion Baron Sims out there may choose to add a set of private lanes to their home, your average Sim wants a local bowling alley where they can meet. The Oasis Springs Dust Bowl comes ready to be placed into your world, or you can convert any Bar, Nightclub, or Lounge into a fully functioning alley. Kids and adults alike will be able to develop their Bowling skill, all while using the bowling lane with up to four other Sims. This five level skill will reward them every step of the way, as they gain access to additional bowling balls, successful trick shots, and more. Sims that are just starting out may end up throwing the ball anywhere but the end of the lane, but those who stick it out and keep practicing will be rewarded by sending the pins flying as they work towards achieving a perfect score! Maybe you want something even cooler for your Sim? Perhaps something that really stands out, even in the dark. How about the excitement of Moonlight Bowling? Enable this on your bowling lane and watch them light up, making your Sim Playful and increasing the fun they gain from bowling. It wouldn’t be bowling without the classic shoes, attire, and neon lights! Mid-century modern tables, chairs, and décor add a great aesthetic touch that brings the retro bowling vibe to any lot. There’s also rockabilly-inspired tops and bottoms to help your Sim look the part, and of course traditional bowling league shirts should you want to form your own bowling crew! We can’t wait to see your Sims hit the lanes! And we know you’re going to create some incredible bowling alleys in a variety of creative themes. 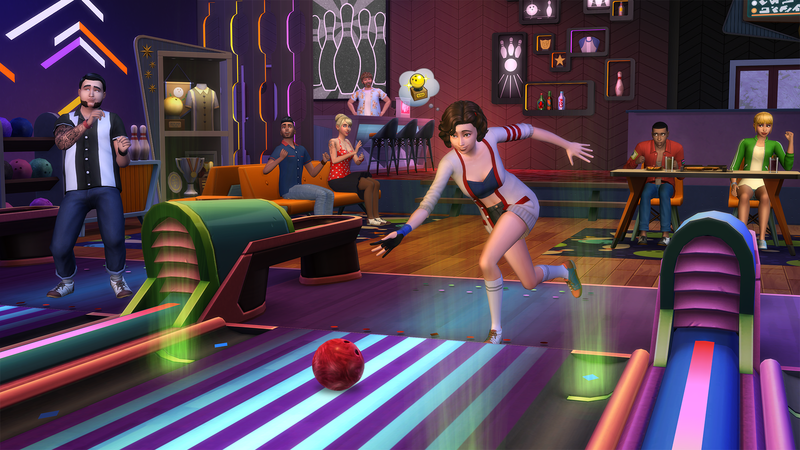 Send us your screenshots on Twitter, Instagram and Facebook, using #TS4Bowling. Previous ArticleThe Sims 4 Play Challenge: A Legacy of (not so) Berry Sims!Next ArticleThe Sims 4 Bowling Night OUT NOW!